For the second consecutive year, the Great Place to Work® Institute has ranked National Instruments among the top 25 multinational companies to work for in the world. This year’s “World’s Best Multinational Workplaces” list ranks NI at number 16. Mark Finger, NI’s vice president of human resources, joined other prominent executives from leading global organizations at San Francisco’s Asian Art Museum for a gala event honoring the companies that received this recognition. Companies including SAS Institute, Google, NetApp and Microsoft also received this honor. With its company mission to equip engineers and scientists with tools that accelerate innovation and discovery, NI aims to create a work environment that is both inspiring and fun for employees. NI employees make products that help customers design innovative medical devices, launch rockets into space and ensure successful operation of next-generation cellphones. For more than 35 years, the work of NI employees has revolutionized the way engineers and scientists develop systems that require measurement and control. The award recognizes National Instruments’ unique corporate culture and commitment to providing quality, meaningful jobs around the world. NI’s long-term management approach recognizes employee success directly impacts the success of the company’s key stakeholders and is critical to long-term growth and overall company success. As NI has grown from a three-man operation to a multinational organization, it has maintained its entrepreneurial spirit and collaborative nature that spurs innovation in every area of the business. NI also holds the philosophy that a well-balanced work environment improves employees’ well-being and inspires excellence. To support that philosophy, NI offers its employees professional, personal and community development initiatives, volunteer opportunities and wellness programs and facilities. National Instruments has been named one of the best places to work in America for the past 13 years by FORTUNE magazine and the Great Place to Work® Institute. Several NI branches around the world also have been recognized as some of the best places to work by the Great Place to Work®Institute, including NI Germany (2004-2005, 2008-2012), Italy (2007-2012), Japan (2011), France (2009-2012), Mexico (2008-2009, 2011-2012) and the U.K. (2006-2012). To learn more about the award-winning corporate culture at National Instruments, readers can visitwww.ni.com/company. The World’s Best Multinational Workplaces list is the first-ever list that ranks the top 25 best workplaces determined through the lens of the company employees. Qualifying companies must have appeared on at least five national Great Place to Work® lists, have at least 5,000 employees worldwide and at least 40 percent (or 5,000 employees) of their global workforce must work outside of the company’s home country. 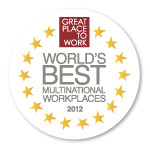 The 25 companies were selected from more than 350 multinational companies from 45 countries that participated in Great Place to Work® best workplaces list selection processes in late 2011 through mid-2012. National Instruments (www.ni.com) is transforming the way engineers and scientists design, prototype and deploy systems for measurement, automation and embedded applications. NI empowers customers with off-the-shelf software such as NI LabVIEW and modular cost-effective hardware and sells to a broad base of more than 35,000 different companies worldwide. No one industry represents more than 15 percent of revenue. Headquartered in Austin, Texas, NI has more than 6,600 employees and direct operations in more than 40 countries. For the past 13 years, FORTUNE magazine has named NI one of the 100 best companies to work for in America.